Read what some of our past customers think of our products. …It has withstood rain, intense winds and a 3 day dust storm…. The gate shown was Automated with your product, 1/9/2018. It has withstood rain, intense winds and a 3 day dust storm. With faultless and reliable operation, it has become a considerable asset. Additional images depict an isolation box. This essential component was fitted by our installer and provides complete control in all situations. PS. Termites will be disappointed when we fit a new STEEL strainer Post. I’ve attached a few photos of our double solar gate kit that we purchased from you in August 2015. Gate has been extremely reliable, opens every time even from the top of the hill, 350 metres away. Operated at least twice most days. The installation was straight forward.Definitely scored quite a few brownie points with the Wife, no more dirty shoes or wet clothes. We plan to purchase the Super-24 solar sliding gate kit to access our house paddock. Look forward to doing business with you again. Will order shortly. I haven’t had to get out of the car to open and shut the gate once in 10 years! We bought our “Sun Power Auto Gates” many years ago, & they have been worth every cent! I haven’t had to get out of the car to open and shut the gate once in 10 years! Not getting wet in the rain or hail, not getting cold in the freezing weather, not worrying about getting out of the car in the middle of the night! And no arguments with who’s turn it is to get the gate. Hi. I purchased the solar double gate opener kit from the Seymour Alternative Farming Expo two years ago. Had to do a couple of minor changes as I wanted the master unit on the opposite side to the normal setup, as well as needing the gates to open to about 115 degrees without hitting the opener units. All a relatively easy process once I read the the installation instructions properly and set the switch cams correctly for my application. Still running the original battery so fairly stoked with the whole thing. Cheers. 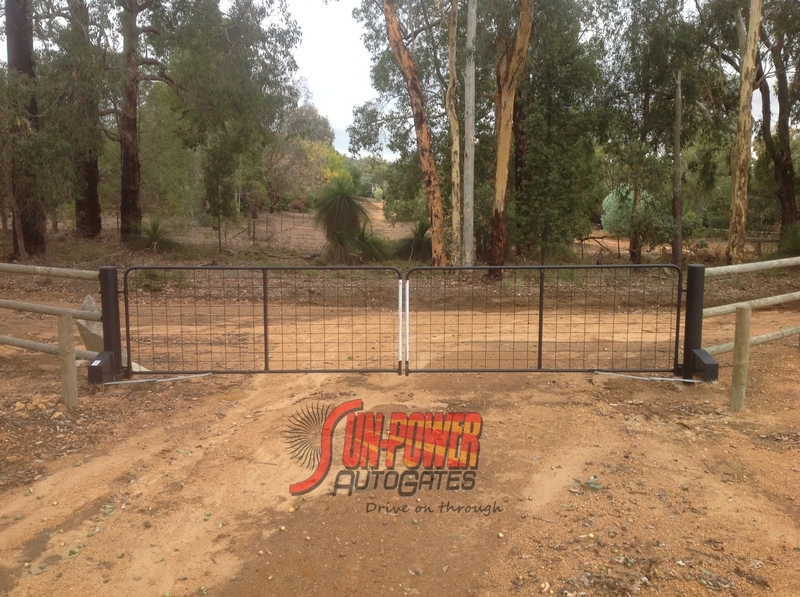 “We installed a Sun-Power Solar-charged Gate Opener over five years ago on our rural property in the Snowy Mountains. This gate is our main property entrance via a Right-of-Way and so is required to open frequently and reliably. The Gate Opener has exceeded our expectations in its operation, averaging about 4-6 openings per day, every day since installation plus some family occasions where, with guests for a wedding etc, it would have opened over 80-90 times in one day!! You may recall that I called in to your shop at Fyshwick a few weeks ago to collect a couple of extra remotes for the double gate opening system we bought from you around 3 years ago, and had installed at our house in Port Vila, Vanuatu. I wanted to let you know how very pleased we are with this equipment. It has not missed a beat in the three years of operation, and I feel that is quite an extraordinarily achievement given that during this time we experienced cyclone Pam (March 2015), and several other smaller cyclones since. Cyclone Pam was a category 5 storm, the strongest ever to hit the South Pacific, from which Vanuatu is still recovering from two years later. The meteo people tell us that if there was a category 6 cyclone rating, (cat. 5 is the max.) it would have easily qualified as category 6. So, all things considered, we are hugely impressed by the strength and durability of our Sungate!! Keep up the great work!! I purchased my Sun Powered Auto gate system more than 12 years ago. The reason I chose your product was that it was Australian made so there was a far greater chance that the system would have greater service life and operation reliability these two factors are critical to me and my family and after 12 years of faultless operation I’m glade I chose your product. The system has had minimal maintenance over its life in-fact it’s only been changing the occasional battery not bad for the amount the gate is operated each day (3 to 20 times). I would to also say its nice that I can call someone in Australia and have any questions answered on the system straight away as having a human feedback loop is important when resolving issues little as they might be (programming new remote controllers). Thanks again. 100%. A very affordable “luxury” that makes life easier. Thank you for your technical assistance regarding my solar gate system. You advised me on what you thought the fault might be and was spot on. The ordering was simple and hassle free. The motherboard has arrived quickly and with the assistance of the enclosed instructions, easily installed and working again 100%. 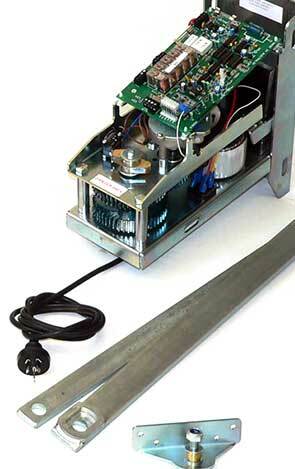 We purchased the original kit (Sun-Power XP Series Swing Gate Operator) approximately 10 years ago and this is the first time I have had to buy replacement parts (wear and tear). We decided to buy your product for many reasons, but when buying online, the fact that yours is Australian Made sold it for us. It can certainly tolerate the extremely hot summers, very wet and frosty winters that we endure here in the Riverina. Thanks again. Great to do business with you!! Every step of the way these guys tried to help. A few words about the team at SUN-POWER Auto Gates: I contacted them after putting up with my faulty gate opener (purchased elsewhere) for too long. It was not working some days and others it would go and open for no reason. I thought I was up for a new one and found that SUN-POWER Auto Gate’s motors looked the same as mine which was about 12 years old. Not once did these guys try to hit me for dollars. They could have easily sold me a new motor but instead said we could help you out and send you some parts to fix what we think is wrong. After talking I decided to send my unit back to get serviced and repaired properly. The final cost was less than half the price of a new one. Every step of the way these guys tried to help. You just can’t ask for more than that! Thanks for your help the other day. Parts arrived Friday as promised. Good to see a small Aussie business offering a great product supported by excellent after sales service. This is just a short note to say thank-you for the automatic gate we purchased through you. With record rain so far this wet season in Darwin It has been great not having to stop to open a gate. We are so impressed we are spreading your name to others up here. Thank you again for a great product that was easy to install. I purchased a Sun Power Auto Gate Kit from Progressive Controls about 3 years ago. I can do no more than give the highest recommendation regarding the reliability of the gate and mechanism and the post-sale service, re: any enquiries, has been excellent! Visitors, contractors, guests are all stunned as the gate miraculously opens as we approach. I always remember the old saying that the opening of a gate is an IQ test, some more challenging than others. I have read the story about the murderous gate. The gate that struck when least expected. Dad and Mum would drive to town and on the way would come to the terrible gate. Mum would get out to open it, often in rain and mud. The gate was adorned with barbed wire, the catch difficult to undo and when opened the gate would fall off its’ hinge, tear Mum’s clothing and gash her leg .From his comfort zone on the driver’s seat Dad would offer much advice! Today nobody needs to endure such a gate. Our property has a woolshed 7 km from the homestead and is serviced by a farm track. The track has three cattle grids and one gate. It was always most annoying to stop, get out, open the gate, drive through, get out, shut the gate and drive off. This could occur several times a day. With SUN-POWER Auto Gate’s XP SERIES Automatic Solar Powered Gate Opener it is a breeze. Visitors, contractors, guests are all stunned as the gate miraculously opens as we approach. It is a real time saver. Should have had one years ago and one third the cost of a cattle grid. It will see me out.